The hardworking members of the Lana’i Physical Fitness team, who wake up to train at 4:30 a.m. every day in a program that has been a source of pride for the island since the mid-1970s, need the public’s help to get to the national championships May 19 in Pennsylvania. Team coach Steven “Kimo” Hanog learned just two weeks ago that the Marine Youth Physical Fitness National High School Physical Fitness Championships, which had been held in San Diego the past three years, would be run in Fort Indiantown Gap Military Reservation in Annville, Penn., this year. As a result, the cost of travel has increased. The team of eight girls and seven boys needs to raise $18,000 for airfare with tickets running about $200 more per ticket because of the added cross-country leg, he said. (The travel contingent also includes two coaches and two chaperones.) And, the longer they wait, the higher the cost of airfares will be, so the team would like to raise the $18,000 by early April. The total cost of the trip will be about $25,000, Hanog said. 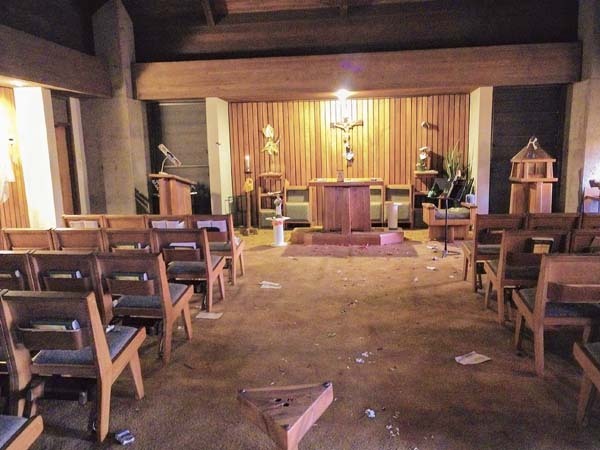 “Our little island of Lanai and visitors that we have met have always been very supportive and have always helped with donations and purchasing fundraiser items,” Hanog said in an email. “The money we have collected has always been just enough to pay for our airfare, lodgings, transportation and food, but due to the fact that the national competition is now on the East Coast it would only be enough to cover our airfare for the entire team. “So this is where we need your help,” he said. The team normally holds fundraisers, selling kulolo, onion bread and T-shirts, but Hanog notes that raising money is difficult on a small island with other competing youth programs. The Lana’i Physical Fitness team has been competing since 1975 in the U.S. Marines Youth Foundation program that aims to ensure that young people are fit. The team has captured six national titles and 27 state titles, Hanog said. There had been state meets until 2001 but since then, Lanai youths have been representing Hawaii. Berths in the national competition are not automatic, he said, because the athletes have to achieve qualifying scores in the five events. The events with separate boys and girls competitions are crunches, pushups, pullups, standing long jump and 300-yard shuttle run with three minutes of rest between events. The perfect score is 100 crunches in two minutes; 60 pushups in two minutes; 30 pullups in two minutes; standing long jump of at least 9 feet, 10 inches; and 300-yard shuttle run in under 45 seconds. Lanai athletes also have won accolades in the Presidential Youth Fitness Program for results in the same events. This program does not require travel; administrators turn in results. 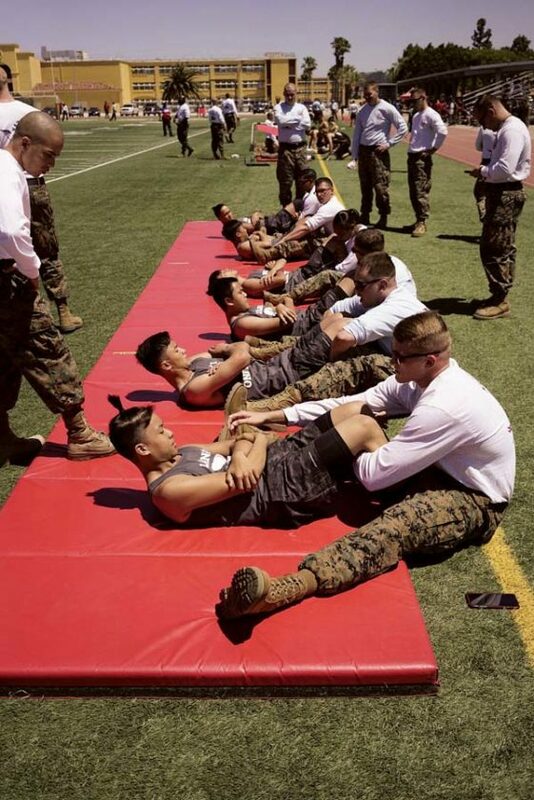 Team members, who range from freshmen to seniors, are selected based on their willingness to adjust their lives and to endure a rigorous eight months of training, Hanog said. Since the inception of the program, athletes rise at 4:30 a.m. weekdays for training sessions. As the competition nears, they train again later in the day. The youths also have to maintain good grades, help at home, stay out of trouble and fundraise, he said. Some students do this while playing other sports as well. “It definitely requires an amazing amount of dedication and discipline to make it through the eight months,” Hanog said. The training program was established by teacher Frank Chester in 1976, a year after Lanai began participating in the competition. “He developed a training regimen that has tapped into the mental and physical potential of hundreds of student athletes; it is training of self-awareness, self-management, self-confidence; it teaches responsibility, teamwork, flexibility and accountability,” said Hanog, a 1977-1980 program participant. The program took a hiatus from 2004 to 2015. Hanog cited the difficulties in fundraising for travel as the reason. 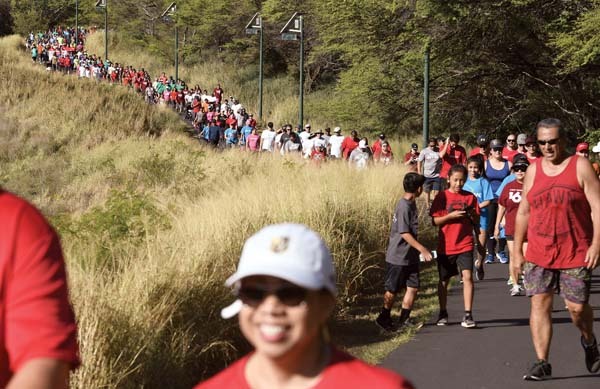 When the old coach, Chester, revealed that he was diagnosed with stage 4 cancer, Hanog said he “made it his mission to resurrect the program to honor his coach and to provide Lanai youths today with the same experiences and opportunities” he received through the Lana’i Physical Fitness program. Hanog also said that the youths he talked to had no knowledge of the greatness of the programs and past Lanai fitness athletes. With the help of program alumni and Chester’s son, a team was formed that competed in the national championships from 2015-17, he said. There were not enough girls to form a team, so they competed as individuals, he said. Two girls took home bronze medals in the 2016 competition. The boys finished eighth, fourth and 10th in their three appearances at Marine Corps Recruit Depot in San Diego. To add to the joy of the resurrection of the program, Chester recovered from his bout with cancer and joined the team at the national competitions, Hanog said. The team hopes to depart May 16 and return May 21 for the 2018 national competition. Donations may be made to a GoFundMe account under “Lanai Fitness team to Nationals.” Donations also may be mailed to Lanai Physical Fitness, P.O. Box 630593, Lanai City 96763.